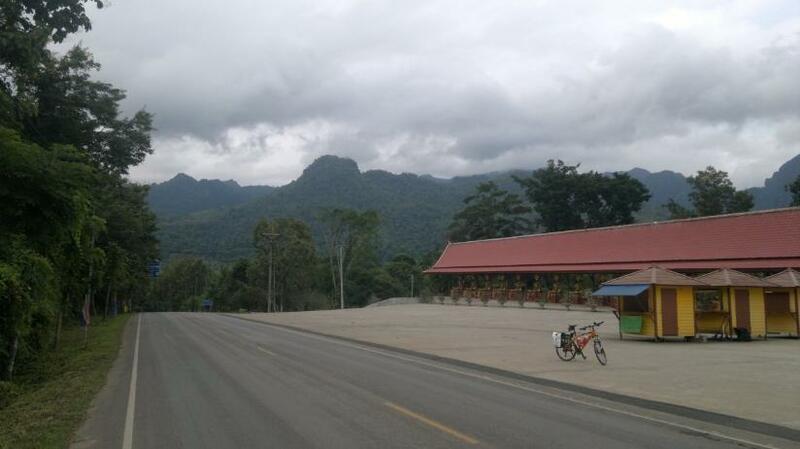 We started our bike trip at the Sai Yok Yai Coffee in Sai Yok and ended the fourth bicycling day at the Phatsapada Resort in Chalae. Technical data of the trip was as follows: Total Distance: 73.33 Km; Moving Average: 21.3 Km/Hr; Overall Average: 15.8 Km/Hr; Maximum Speed: 52.6 Km/Hr; Moving time: 3 Hr 27 Min; Stopped Time: 1 Hr 11 Min; Total Time: 4 Hr 38 Min. We left Sai Yok Coffee at 0630 Hr after having taken breakfast. We continued along the Asian Highway 123 in direction of Thong Pha Phum, the usual stop over point on the way to the Three Pagoda Pass. 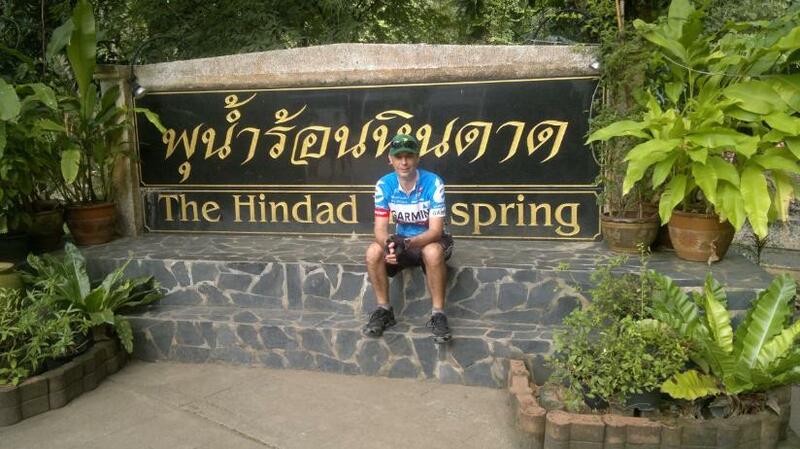 After a good hour of biking we arrived at the Hin Dat Hot Springs formerly called Ban Kui Mang Hot Springs. The springs were accidentally discovered by Japanese soldiers supervising the construction of the Death Railway during World War II (1943) and were not far located from the Hin Dat Railway Station of which no traces exist anymore today. Following a former POW, the small pool located some 50 meters from the general bathing area was reserved for the Japanese camp commander and his local female companions. The mineral spring is believed to cure many diseases. At the time of the earthquake on 26 December 2004 and the deadly tsunami in the Indian Ocean that followed, it was observed that the temperatures of the hot springs along the Three Pagodas Fault abruptly increased. 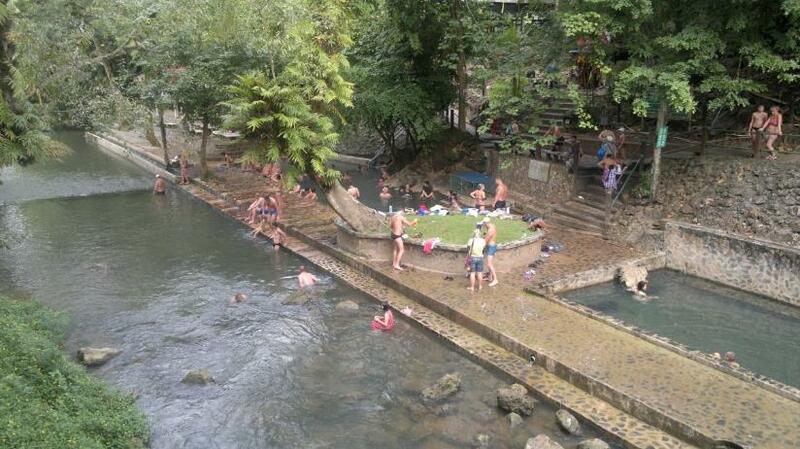 The temperature at the Hin Dat hot springs went up and the water became milky at approximately 8 a.m. that morning. Most of the Kanchanaburi hot springs are commonly located along the lines of Three Pagodas Fault and lower number of hot springs along the lines of Sri Sawat Fault. These two major active faults run from Myanmar to the middle of the Chao Phraya basin, however new evidence suggests that the active Three Pagoda Fault could extend much farther south to the Gulf of Thailand. We biked back to the main road. Shortly before 0900 Hr we passed a pump station with a 7-Eleven shop. It was a good opportunity to fill up our water bottles as well to enjoy a Magnum ice cream. A bit later we left the station and turned right towards Sangkhlaburi at the Thong Pha Phum road crossing, passing by Wat Tha Khanun. In this area were four working camps for Prisoners of War during World War II. Three great cuttings were made north of Tha Khanun and many ravines had to be bridged. From Wat Tha Khanun at 100 meters ASL the road started to climb slowly towards 200 meters until Km 60. From the last point it went quickly up to nearly 400 meters; a steep climb. 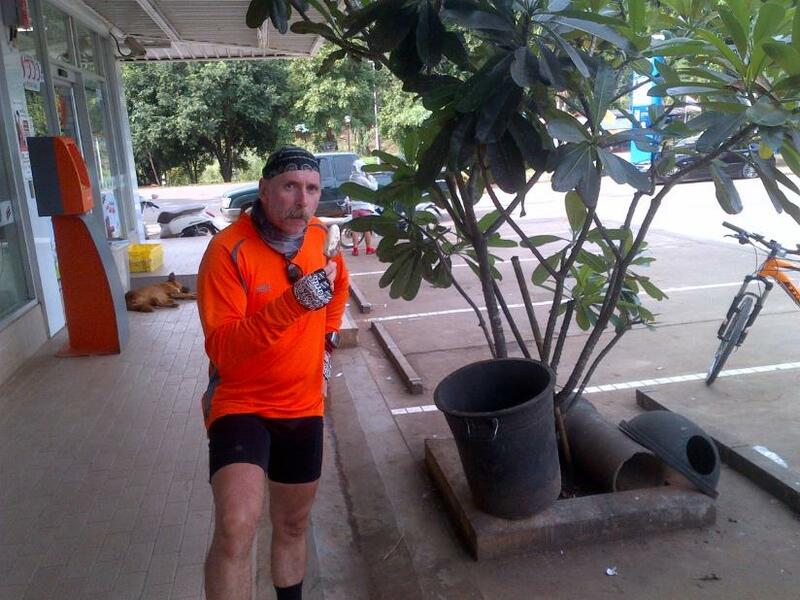 We arrived at the Phatsapada Resort at 1110 Hr. There was nothing much to eat at the resort. We were indicated a small shop with two large tables next door and that was it. Anyway we could get some Phad Kaprao Mu (Minced Pork With Thai Basil). In the early afternoon it started to rain in this hole of Pluto and it nearly continued to do so till the next morning with from time to time a break. We stayed as thus in our bungalows to take a nap for the rest of the day. That evening at 2044 Hr there was an earthquake of 2.5 magnitude on the Richter scale in Chalae sub-district where the resort was located. We felt nothing.